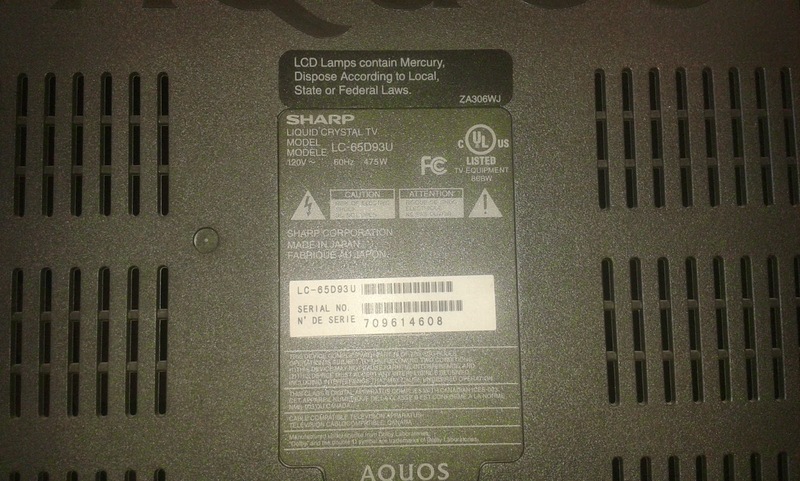 A few hints for people facing a repair on Sharp LC-65D93U due to blinking power LED. Meant to supplement the service manual and tell you a few things it doesn't (or at least not outright) and definitely not a complete guide on how to fix it. By now I forgot, but I believe we had to pull the unit out of the stand in order to take the back cover off. Protection mode kicks in when the main board discovers something considered dangerous and shuts off the TV, locking it out. Fast blinking blue LED and slower blink of blue and green led simultaneously (or, more specifically, they start at the same time, but blink different number of times and report different codes). The service manual gives good information on the various error codes reported when blue and green blink together, but does not say a lot about fast blue blinking, which is what we had: the TV would power on to a blue blinking LED and would not respond to anything whatsoever. To get out of the protection mode, i.e. to tell the TV to attempt to start normally, do this (as per the service manual): disconnect from AC, wait until front LEDs stop blinking, then hold down the INPUT button on the side and, while holding it, press the VOLUME DOWN button (the very bottom one, I think it was VOL DN); then, while holding both of them, connect the TV to AC power and keep on holding until you hear a relay click. Sharp LC-65D93U is a high end TV and has lots of built-in protections and feedbacks from its various modules, which means you can't apply the classic approach of disconnecting a module to see if it prevents the TV from powering on. 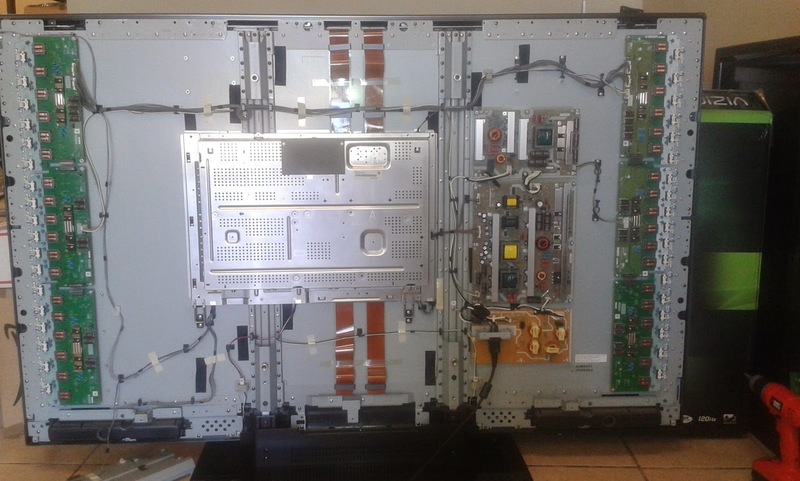 Most LCD TVs would start all right if you disconnect an inverter - they'd just have dark screens - but this one won't. You can't disconnect the T-CON board either and expect it to start with back light, but no image like most other LCDs. The way to do it is to find the feedback signal and feed it false positive information, i.e. make it happy. Skipping another issue we had, we faced the above described behavior, which looked a lot like a bad inverter or bad CCFL or bad power. But how to find which one? 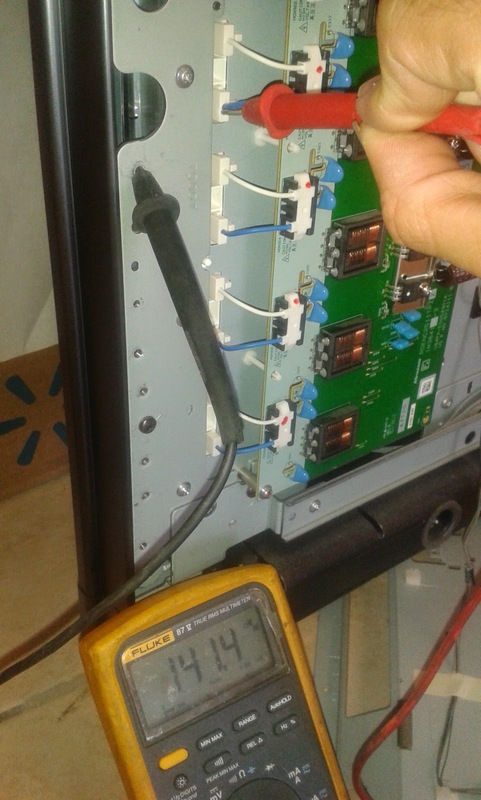 First thing we did was disconnect a whole inverter, specifically the CCFLs on it, to see if it affected image. It did, meaning we could see notable decrease of darkness in that area. By this rude approach we found out that seeming all inverters DID work for a while, i.e. there was visible loss of brightness in the disconnected section for every of the 6 boards. We couldn't measure how much did we lose, though, so if a single lamp wasn't coming up we could not tell which one it would be. And it wasn't even clear it was the inverters that were causing the shutdown to begin with. Important note: the unit would NOT go into protection mode if you turn it off as soon as the display goes black. This simplifies testing when you'd need to power on the TV multiple times e.g. to find out which inverter/circuit is bad. If you miss the moment you'd need to do the INPUT/VOL DOWN/AC POWER procedure again. There, if you do this (and it makes a good contact and inverters receive proper power from the power supply) it will make the main board happy even if the inverters fail due to a bad transformer or a bad CCFL or any other typical reason different from a major shortage on the power supply lines (which, if it were present, would not allow image to show up for a brief moment!). 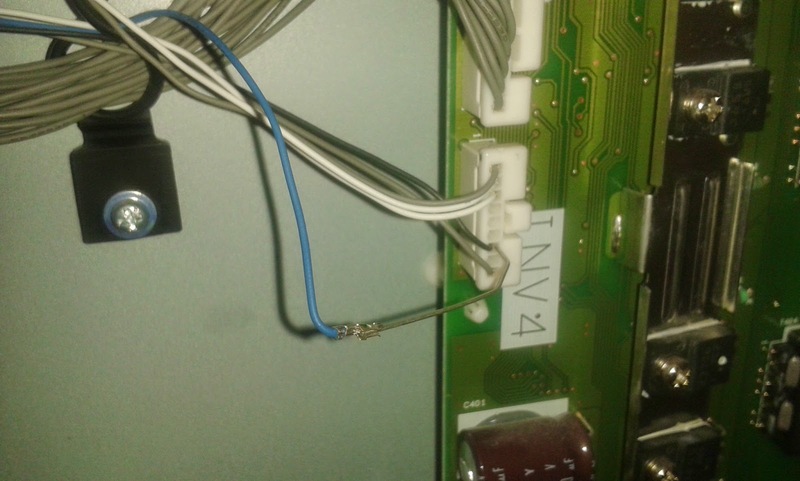 Once we did this the TV did indeed stay on, confirming the suspicion that it was an inverter that has gone bad. But which one of the 6? This is again nothing new and ground breaking and while rather universal is subject to some caveats and conditions which may make it not so widely applicable. More on them later (if I remember), now for the meat: we were hoping that a lamp (and its power circuit) would not start or start and work much different from the rest. Since CCFL lamps are powered with reasonably high voltage, high frequency AC voltage we hope to catch that voltage inductively and by comparison find which CCFL differs significantly from the rest. Polarity doesn't matter and for best reading it is important to try and get as much length of the wire in parallel to the probe's metal lead as possible. Again: AC voltage meter, pre-set range of 60V (that may depend on your device). 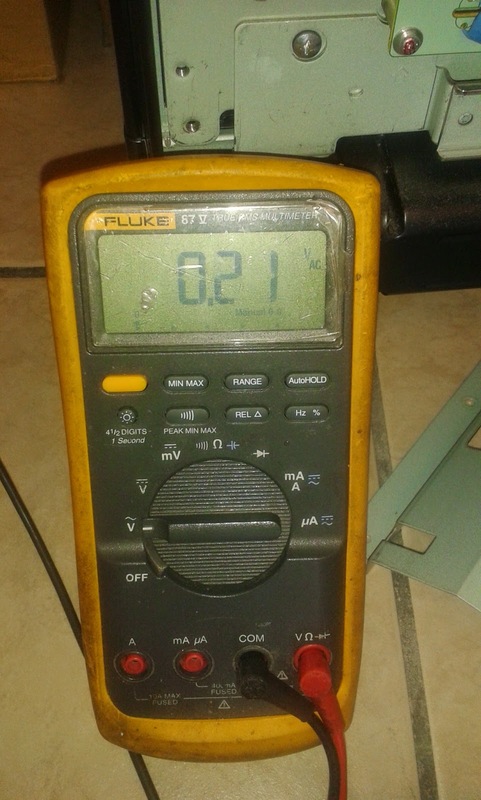 When the backlight activates the Fluke picked up voltage of anywhere between 8V and 15V depending on the lead/cable configuration (angle of placement, how much length in parallel they had etc.). The voltage was there for a very brief time and to avoid TV shutdown and protection you can turn it off (the TV, not the Fluke) with the power button as soon as you get a reading. On ONE of the boards there were NO READINGS or VERY LOW readings on one of the outputs. After confirming the test a few times We thought we had found our bad guy. A reminder: this is not mean to cover all possible cases that could occur. As it turns out the inverters are made of TWO electrical circuits each, with THREE transformers in parallel in each circuit. Transformers are the usual suspect in failed inverters and sure enough we spent some time on that too; I may write another article or extend this one on how to test the transformers on the boards, but I'll skip that now as the article is already getting too long. In our case it turned out that it wasn't just ONE lamp that was not getting power for the brief moment when others were; it was THREE connectors (six lamps altogether) that were having the problem - every other on the faulty board. We reasoned that if a single CCFL lamp was bad (or a connection to it) then it wouldn't affect the other two transformers circuits (the other two transformers) or if a transformer was bad, then unless it was bad in the primary winding it would also not affect the other two for the short time when everything worked and the output voltage would be picked up after the other two inverters. I can't say with certainty how much of that reasoning is true - I am software developer by heart and just hacking my way into the hardware world - but I'd say that you should test the other transformers' outputs too. If a single transformer output is lacking output then you have bad transformer or bad CCFL. If all 3 are missing then it's got to be something BEFORE the transformers. One was a 10 ohm resistor found in the gate of one of the driver transistors found in 2 pairs on each board. The resistor has simply opened and the transistors could not drive the transformers. Replacing the resistor made the board work. The other (which we sort of caused while testing, i.e. after we got the TV to work reliably and started testing other boards on it) was one of the SOT-23 (or similar) transistors found in 2 pairs of 3 transistors (i.e. 2 groups of 6 transistors, 3 and 3 of a kind), which was lacking base/collector or base/emitter junction resistance as expected. As of right now I do not remember what they were and I did not take pictures, unfortunately, but that's what it turned out being. Again, that doesn't mean it can't be a transformer in your case. As a result of our efforts we have some transformers available for purchase. Check at www.coppelltvrepair.com or our eBay store. Hope this helped. If it did please leave us positive feedback somewhere on the Web...we'd appreciate it! 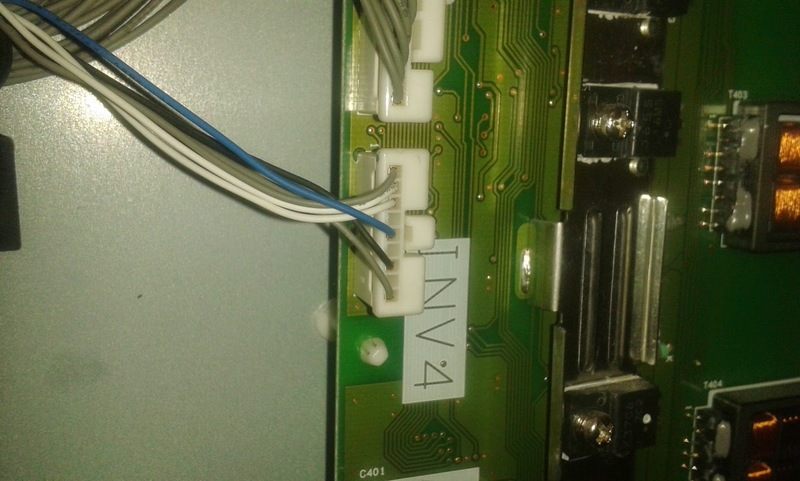 Question: "Hello, I would like to know if I have a bad Y-main board, I have tested Q5004, Q5005 Q5006 Q5007 Q5012 Q5013 Q5027 Q5028 Q5029 Q5030 are good. Does it mean the other board is defective instead of Y- main board?" This answer is valid for pretty much any other sustain board I am aware of ... as well as any other electronic module which can not be (easily) tested in standalone mode, but only as part of a set made of several modules working together. You can't tell if a module - Y-Main LJ41-04516A in this case - is working fine just by NOT finding a problem on it. It is first because of the simple reason that you have not checked every single component on it and you can't be certain that they all work and second because you may have tested all of them individually (hardly, but theoretically possible), but you haven't tested them under load and that still leaves quite a good possibility for some of them NOT working. The most (and for practical reasons the ONLY) reliable way to know if a sustain board is working is to to put it in a working set and see it function properly. It is theoretically possible that you may put a sustain in a set without , say, a display (or with disconnected buffers) and measure the outputs of the sustain with a multimeter or, better yet, a scope. That gets close, but in reality is still far enough from seeing actual good image on a plasma display. A lot of experience with a particular board - like we have with the boards we offer repair services for - can, to a degree, work as a substitute to testing on a real set, but for the same quoted first reason above it can't be a full, guaranteed substitute. We only offer repair services for sustain boards that we can test and see working on a set. Note that the opposite test is more applicable and beneficial: if you do find a failed component on a board (specifically one that you know tends to fail) by means of testing then you do not really need to test the board in a set. It is bad. But the only practically certain way to know if a sustain board is good is to test it in a live, known working set. The alternative is undefined and unprofessional. By chance, during our recent move into our new location, we lost the testing unit for that same sustain board, LJ41-04516A. We instantly increased prices of all listings to a practically prohibitive level and told all customers who had already submitted a board that we are unable to provide a proper service and have to cancel it. 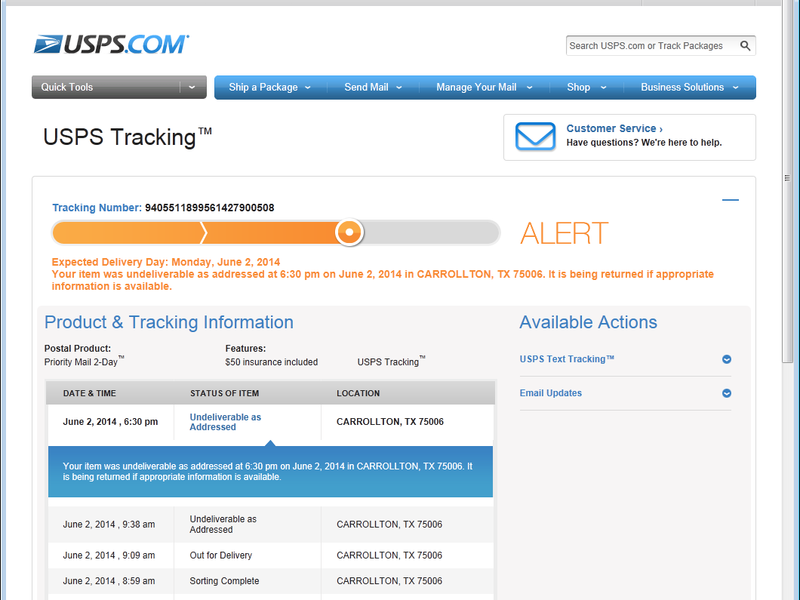 Update June 04, 15:30 PM: Just received a call from the local mailman. He has been receiving parcels for us for the past few days, but he was not aware we have already moved in and he has been passing by our building. Eventually he realized there's too many packages and has found my phone which I gave to him when we met shortly after I bought the building. This must have been the culprit of the delay and I am told we should be receiving close to 20 packages tomorrow. In the last week of May 2014 we moved our shop from a location we were leasing for the past 3 years to a building we practically own. The new address is available on the website and we've been working to update it on popular Internet repositories as well, so far without success. There's always delay in those things unless you're willing to pony up $300 or so quarterly or something like that. Anyhow, here's the focus of this post: for reasons unexplained there is a delay in processing packages sent to us via USPS. We are simply not receiving them yet. If you sent us modules and they were supposed to be delivered to our old Belt Line Rd., TX 75006 address on May 30th, May 31st and the first days of June there will be an extra time due to the packages being first delivered to the local postal office and THEN forwarded to our new address at W Hebron Pkwy, TX 75010. I was told that forwarding should have kicked in and packages sent later would be forwarded before a delivery attempt to the old address is made first. The forwarding of some packages, however, will occur only AFTER they reach the local USPS facility and a local delivery attempt is made. I guess it has something to do with the date of forward activation kicking in. I was at the local USPS office today and they assured me that even though the message says that the package is being returned, it is actually being re-routed. I do not know yet if this is true; we will know when we either start receiving the packages or customers start receiving them back. It is hard to say why all this headache when we told local mailmen to just drop off packages at the next suite as they have been doing if by chance they happened to arrive and find the shop closed (like every Saturday). They would either 1) Attempt delivery on the next day; or 2) Leave a note and hold parcels until we go to pick them up; or 3) just leave parcels at the next suite. In this case we've filed a forward request, told local mailmen we want them to leave packages in next suite and left a message asking them to do the same. For a few days we've been picking boxes from our former neighbor, but it was only UPS and FedEx. Then yesterday there was nothing there anymore and we received our first deliveries from both FedEx and UPS at the new address. We apologize for the inconvenience to you and your customers, if you have any...but we feel we've done what we could. Ideally all they had to do was just left them at the next suite...not sure why they didn't. But we again apologize for the delay.